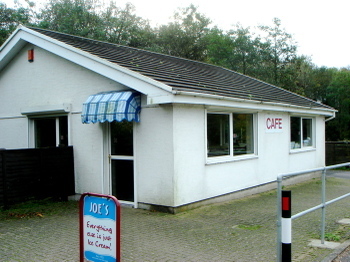 When we visited this fantastic place we assumed it was just called 'cafe'. Which I liked. But then I found it on transport cafe and it seems to be called The Rhos Transport Cafe, which has a similar utilitarian feel. 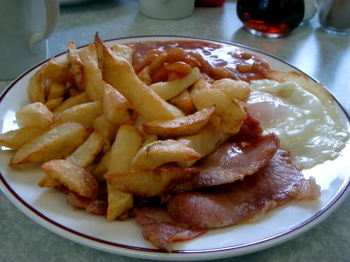 This is the best fry-up I've had in a long time. Absolutely magnificent. Look at those chips, they look like dragons teeth, and that bacon looks like it's been torn from the pig by the Pontypool Front Row. The egg is a limpid pool of lovely and the beans are dark and brooding, waiting to delight you once you've cleared the mountain of grub. 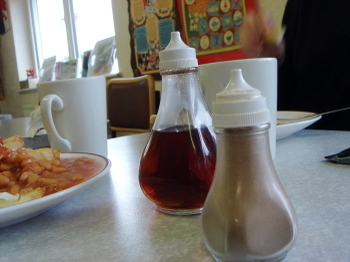 Simple, effective condiments. The minimum. Just what you need. I love a good counter for queuing and a splendidly tall steam machine. Like the remnants of a Welsh space programme. And all those dragons on the top shelf, waiting to be much-loved souvenirs. Arthur's very attached to his. And perhaps the best tea-towel display I've ever seen. 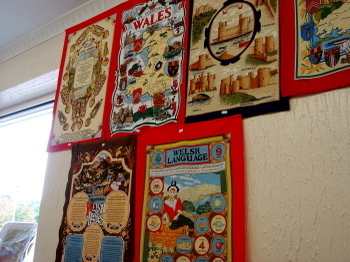 Tea-towels, a much neglected aspect of our cultural heritage. I wonder if there's a tea towel blog? gotta agree with you here: those chips look like the best you've featured in yonkers. Just look at those lovely brown edges. Just like the Kakanui Hills in Summer. ooo those chips do indeed look superb. The crucnchy edges are what I imagine a dragons skin to feel like. In fact the chips seem to resemble a noble welsh dragon which has crashed into the a deep bean sea and while struggling to escape is raising one chip-like dragon claw into the air. I've been following your blog for awhile now and salivating over all the pictures of your egg, chips and beans. Today's chips are the be all and end all of chips. I can see those crispy brown edges and am almost drooling here. You DO get around don't you! You can come to my place for some egg chips and beans if you want! What is the Pontypool Front Row? ok i take my other "amazing" back. this is really amazing. I came across this web site whilst searching for all day breakfasts. I think that it is great to have cafe reviews but feel that the site could be adapted to be more user friendly (I'm an old, non digitised person, so may have missed something!). I believe that you should include a site search related to roadname (A1, A49 etc.) or counties/cities so that hungry travellers like me could easily plan visits when in the area. It takes far too long to scan your ever lengthening list. 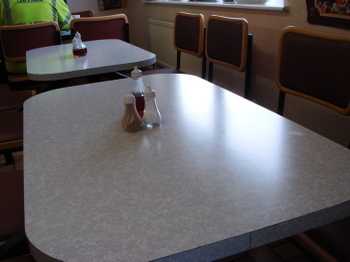 My current quest is to find a breakfast establishment on the A49 somewhere between Warrington and Ludlow. Any ideas? 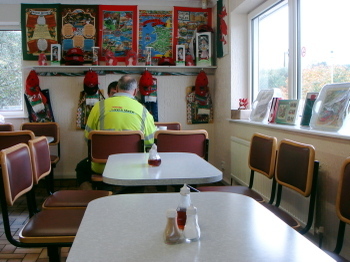 This looks just like the cafe they use in Little Britain series 2. 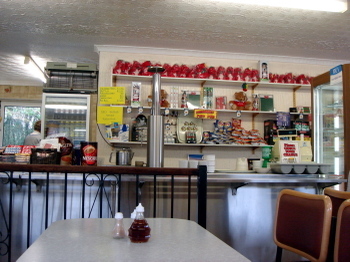 It's called The Rookery Cafe, in a town called Dump haha. 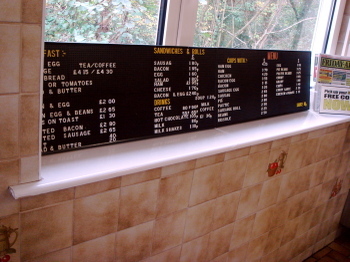 Hi, did you know that Euston's Sandwich Bar has shut down? We were dissappointed.